Double data plans are now the best data plans that gives you 2x the regular data capacity. This is what I usually call value for money data plans. Recall, MTN was the first telco to launch double data plans before other networks followed up with the same plan. 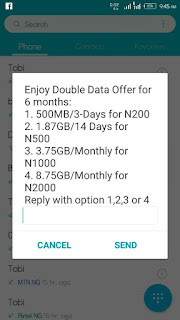 Here in this article, i have taken my time to compile all double data plans for MTN, Glo, 9mobile, Airtel and how to activate it on your own line. Like seriously, I've been doubling any data plan i purchase from MTN for over a year now and it's been helping me for sure. This is the time for you to start enjoying yours if you are yet to. The double data plans when activated works on any phone, be it Android, iOS, Windows phone, Tablet and also works on PC. Below are the doube data plans for all networks and how to activate them without tweaking IMEI. Before now, you will receive the bonus offer automatically from MTN whenever you insert your sim in a new phone. 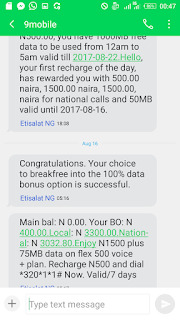 This is how you can activate MTN double data bonus Here. 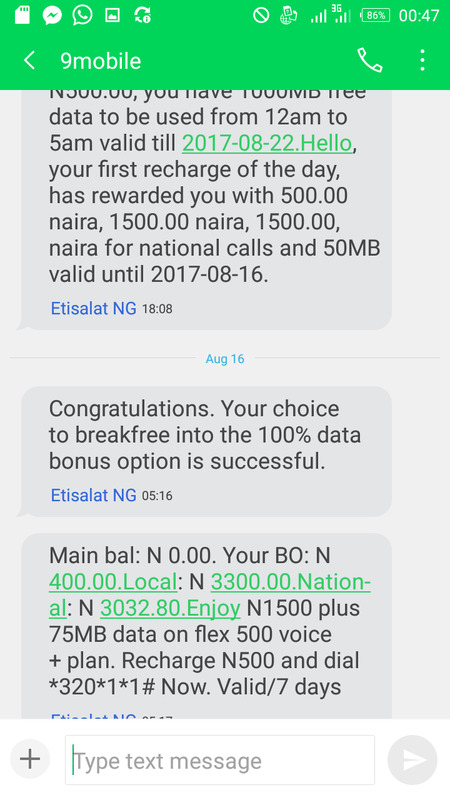 Airtel double data bonus is not sim selective. All Airtel subscribers are eligible for this offer both old and existing customers. You can dial *144# to purchase any of the applicable data plans. To check your data balance, just dial *140# and note that you will keep getting double data offer till 6 months. Also note that the validity of the data purchased is based on the type of data plan you bought. 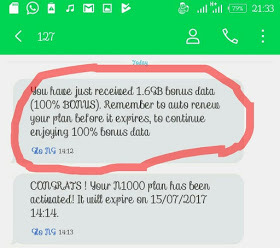 Glo 100% double data offer is not sim selective as all Glo subscribers are eligible for the offer, both new and existing customers are eligible. Firstly, buy any Glo official data plan by dialling *777# and don't cancel the auto-renewal service. To check your data balance, just dial *127*0# and enjoy your browsing. 9mobile 100% double data offer is not sim selective but based on Tariff plan. If you are using 9mobile network, you can migrate to Morecliq tariff plan by dialling *244*1# to enjoy the offer. After successful migration, dial *545# and activate the 100% double data offer. Now, subscribe to any 9mobile data plan and it will be doubled automatically. To check your data balance, just dial *228# and enjoy your browsing. The double data offer are the best feature to activate on any network in Nigeria rather than wasting money on little data plans. They doesn't zap but are official data plans from the network providers. That's to say it's not a cheat and doesn't require any VPN or whatsoever. The doubled data can be used to chat, stream videos, download, surf and do anything online, just like you have been doing. I hope you find this post useful. Please take a moment to share this post with friends and don't forget to leave a comment below. The glo thing isn't anything new.. If you renew your data plan, you'll always get double data post. What does the pop up say? Wow. This is nice. If to say I know, I for do am before I sub. BT my own glo sim does not auto renew and I didn't deactivate it how can I do it? Subscribe for a new data plan, auto renewal will be activated automatically for you. Kachi.. Airtel selects sims.. I wasted 2k twice.. when i called, dey said not everyone is eligible.. I'm rocking mtnz own though..
Before subscribing again, to avoid any lost, subscribe for a small plan first to confirm that the double plan is active, before subscribing for a bigger plan. That's what I do. These are the reasons why I like this site, you will always get updated on new development, thanks for this. Not really a cheat though! Pls let us drop alot of positive comments so that others visiting other blogs will be attracted towards it. Pls kachi can it work when you have an active data plan. All mtn users should avail themselves of this golden opportunity because me I will try mine asap. The 9mobile plan only work from 12am to 5am right? Only Cliq4DNite and YouTube bonus works only at 12am to 5am.